Today I was driving on Burrard near Broadway and on y right I saw a little restaurant/café. I remembered that in that exact spot in 1980 there was as shop called Precision Camera Repair. It was there that Burt fixed my waterlogged Mamiya RB-67 that fell into a hot tub when I was taking pictures of beautiful fitness instructor Dana Zalko for Vancouver Magazine. I had my camera on a tripod on the edge and I had attached a heavy long lens. The tripod head loosened. The lens swung the camera down and the whole rig plummeted into the water. Burt fixed the camera in a couple of days and told me that what saved me was that it was not salt water. The film I retrieved and processed and it was just fine. Years later I kept going to Burt when he worked at Brighouse Camera Repair. When Brighouse closed in the late 90s I never heard of Burt again. The location of the photo repair shop on Burrard lived in my memory as a sort of human, living GPS. Few would now know about it. As soon as I am gone, and a few more like me, the memory of that location will be nonexistent and in some curiously sad way Burt may be gone, too. 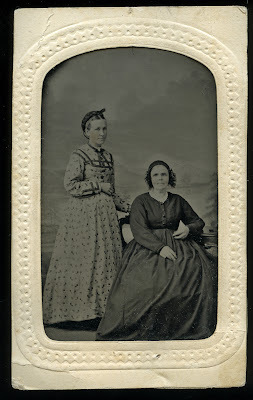 This tintype here is one of the best preserved tintypes I have seen. It was given to my wife Rosemary by her mother Marjorie perhaps 25 years ago. Marjorie Healey is dead. While alive she may have told Rosemary who the two women were. But Rosemary told me that she wasn’t interested at the time. There is nobody alive now who could ID the two long gone relatives. Marjorie Healey’s maiden name was Cooper and her mother was Davis. On both sides of her family they were originally from Ireland. I note that in back of the women in tintype there are some low hills. Could those painted hills have been artfully mimicking the old country if the tintype was taken in Canada? Who knows? But I feel sad, not for the women, who would not feel my sadness, but for myself because I have always known that memory and death are somehow at opposite poles. I try not to think about it but all I need is a little café, once Precision Camera Repair, to reinforce that some day my image (be it on an ancient old fashioned computer monitor, or in the form of a gelatin silver print) will be seen by someone who will not know who I am. I will be as dead then as dead can be.